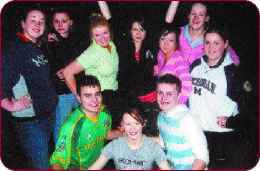 The Revue dancers (back from left): Coleen Byrne, Laura Digan, Jone Alforo, Lee Van Rooney, Sara Alford, Erika Byrne, Rebecca Dempsey; (front): Dean Hendrick, Alison Daniel and John O’Lane. Missing from photo are Maeabh O’Callaghan and Claire O’Callaghan. DUE to circumstances beyond their control, the Enfield Revue Society has had to cancel the show’s extra date on Friday, 2nd March. However, the original three nights still stand and the popular variety show will now run from Tuesday, 27th February to Thursday, 1st March in the Hamlet Court Hotel, Johnstownbridge at 8pm sharp. The show makes a comeback this year with a fantastic line up of music, song, comedy and dance. More than 85 people are involved in the production and a mixture of old and new faces will take to the stage for the twentieth Enfield Revue Society Variety Show. The first show was held in 1984 and the annual show continued until 2002 but the society was wound up after that as people had different commitments and it was difficult to form a committee. It all started again in June of last year when a few past members got together and held a meeting and it all took off from there. The re-launched show will not disappoint and rehearsal after rehearsal will ensure the cast deliver a polished performance to entertain all the family. The show will see 35 people take to the stage made up of actors, choruses, soloists and dancers. Members of the comedy cast will all be familiar to the audience as they were involved in previous shows. However, the chorus line is made up of mostly new faces with just two members having danced in the show before. Tickets available at the door and are at a first-come-first-served basis. However, if previous shows are anything to go by, there was always a full house 15 minutes before the show started so you are advised to go early. Admission: Adults e10, Children e8, OAPs e8. Group rates available.